The Pacific War Online Encyclopedia: Radford, Arthur W.
Table of Contents Next: Ragsdale, Van H.
"Raddy" Radford was born in Chicago and graduated from the Naval Academy in 1916. He served on battleship South Carolina throughout the First World War. He completed flight training at Pensacola in 1920, and served with the Bureau of Aeronautics and with spotting units in the Battle Fleet before commanding an Alaskan aerial survey in 1929. He then alternated service between staff positions with the Bureau of Aeronautics and sea duty aboard carrier Saratoga. He commanded naval air stations in Seattle and Trinidad, was executive officer of Yorktown, and served as head of Aviation Training after war broke out. He was credited with maintaining high standards of training under tremendous pressure, which likely helped him achieve flag rank without ever having commanded a ship. Radford was promoted to captain on 2 January 1942, served briefly with Carrier Division 2, and was promoted to rear admiral and command of Carrier Division 11 in July 1943. He participated in the Gilbert and Marshall Islands operations before returning to Washington to serve on King's staff. In November 1944 he took command of Carrier Division 6 for the campaigns against Iwo Jima and Okinawa. 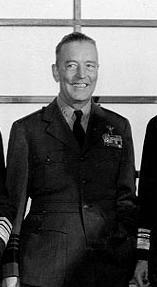 Postwar Radford became fleet air commander at Seattle before being promoted to vice admiral and deputy chief of naval operations for air in January 1946. In January 1948 he was promoted to full admiral and vice chief of naval operations. He participated in the "Revolt of the Admirals" in May 1949, seeking to preserve the Navy as an independent service. His career survived, and he became the first naval officer to serve as chairman of the Joint Chiefs of Staff, from June 1953 until his retirement in August 1957. He became a business consultant during his retirement. Radford was considered a brilliant and aggressive officer, a natural pilot, and an excellent administrator. His recommendation to Halsey in June 1945 to steer clear of heavy weather was ignored, and Halsey put 3 Fleet in the path of a typhoon.